V3.9: some units would drain power much faster than they should when switched off. This was fixed in V3.9. 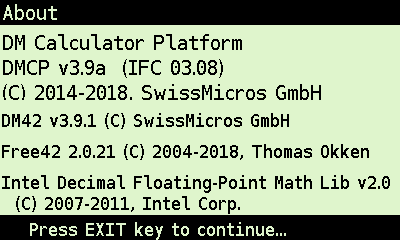 A binary combining both DMCP-3.9a and DM42-3.9.1 is also provided for convenience. dm_tool V2.4 allows you to flash the DMCP firmware (previous versions didn't) and the 32-bit Linux version was unable to flash the QSPI binary. This has been fixed. This said, using dm_tool to update your DM42 is now deprecated and has been since the ability to update via the FAT drive was introduced. The method for updating your DM42 is covered in the manual. The latest firmware binaries are available here. This time I tested a new way to update my DM42: directly from my Android tablet ! I downloaded DMCP V3.9a and DM42 V3.9.1 on my tablet, connected the DM42 with a USB OTG cable and activated USB Disk in the Setup menu. The DM42 was recognized as a USB key and I copied to it the new firmware files. I then ejected the DM42 on my tablet without unplugging the cable, pressed EXIT on the DM42 and the update process started on the DM42. However after the update I found that the Programs and State directories on the DM42 were empty and I was not able to transfer any file to them from my tablet, every time I got an error message. I connected the DM42 to my PC and I was able to restore the content of the Programs and State directories without any issues. After that I connected again the DM42 to my tablet and this time I was able to transfer files to the Programs and State directories. So it seems that when Programs and State are cleared during the DMCP update process (btw is this normal?) they are left in a state that is not clean and requires some action from the Windows file system to work properly with my Android tablet. Now regarding the update content, having a different font size for each stack register is cool and allows for example to have Z and T smaller than X and Y. I personally don't see the need for the new LXYZT layout but others may. One comment regarding the setup of the registers font size: if I didn't miss something you change the font size with ENTER or with the number key corresponding to the register and the size is increased by 1 and when the maximum size is reached (5) it goes to the minimum (-5). It would be good to be able to use the + and - keys to increase/decrease the size. Wonderful this new feature allowing to display the LASTx register at the bottom of the stack! 1. New DMCP and DM42 App, using combined image and dm_tool_v2.4. Fast, smooth, no issues, no loss of State, etc. One unexpected thing is the prior DM42 App (DM42-3.7.1.pgm) remains in the FAT area; after a moment's thought this does make sense (since it was there before the update) but initially I thought something had gone wrong. So if updating this way, be sure to also copy DM42-3.9.1.pgm to FAT once you're done with the dm_tool update process. In fact, going forward you can have the prior and latest DM42 App versions on the FAT at the same time and can easily swap between them if you need to check out or compare the results, show someone else new changes, etc. Really flexible. 2. Latest Help file (manually download and copy to the HELP folder in the FAT). Very nice updates all around, thanks guys! Ditto, but using separate images and RAMdisk update. No problem and nice new features; just have to choose the most pleasant (to my eyes) display setup. Is that third one the combination of 1 and 2? If so, we only need to copy #3 to the DM-42 drive, correct? Yes, that is a single image with both components. I think it's correct, but as I wasn't 100% sure, I loaded it the old-fashioned way with dm_tool_v2.4. It makes sense what you suggest is correct as the combined image is a .bin file and they indeed can be installed via System > Flash firmware from FAT. Take a leap, give it a go, and let the rest of the folks know this for sure with an update to this thread. But as I noted above, you probably should also subsequently copy the DM42-3.9.1.pgm file to FAT after you complete the above upgrade, so that you have a copy to load if you dabble with the SDK demo programs. As I posted; I tried the "bundled" version, #3 if you wish. The DM42 loaded the firmware and started the 42-program. As rprosperi mentions, you may, (if you "install" other .pgm), copy the #1 program-file into the FAT, as, when using #3 will delete the .bin-file completely. Though, my update took something around 2 minutes and it loaded the last used state file as well. That means, I did not lose any of my programs og settings.